Opioid overdose is now the leading cause of death for Americans under 50. This is a staggering statistic reflecting a national public health emergency. 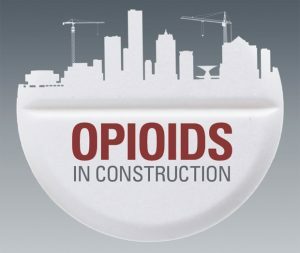 A study released this month by the Massachusetts Department of Public Health reported that construction workers, farmers and fisherman are particularly at risk with higher than average rates of overdose deaths. The opioid-related death rate for employees in the construction and extraction industries was six times the average for all Massachusetts workers. Other occupations with significantly higher than average rates of opioid related deaths among Massachusetts workers included: material moving; installation, maintenance, and repair; transportation; production; food preparation and service; building and grounds maintenance and health care support. What all of these occupations have in common is that they have a particularly rate of workplace injuries. The report documents a disturbing trend of workers becoming addicted to painkillers after being hurt on the job. Opioids are frequently prescribed for pain management following a work-related injury. The Massachusetts finding is consistent with a report from Utah which found that 57% of those who died from an opioid overdose had suffered a work-related injury at some point in their life. It is also consistent with estimates compiled by the Midwest Economic Policy Institute which reports nearly 1,000 construction workers across seven Midwestern states died from opioid related overdoses in 2015. These findings underscore the importance of employers developing educational and policy initiatives targeting high risk populations to prevent opioid-related deaths. These initiatives should include addressing workplace conditions that cause injuries for which opioids are prescribed, pain management education following injury including information about safer opioid prescribing practices, and access to evidence-based treatment for opioid used disorders. Fortunately, there is a great deal of research now into a wide range of non-drug and non-invasive treatments which are proving effective in relieving many chronic pain problems. Employers should take advantage of the expertise of their EAPs and collaboratively develop plans to ensure that employees have access to accurate information about addiction, addiction treatment, and alternative pain therapies. It is, most literally, a matter of life and death.